Capital Design Group is prepared to design and build your project for you. 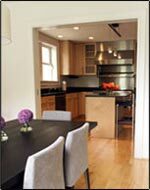 Or, if you are already working with an architect, we will gladly serve as a general contractor. What's the main objective for your project? What limitations are you bound by? These are just a few of the questions we'll address at the beginning of your project. At CDG we realize that without first understanding your goals it's impossible to produce a successful final product. Initial Consultation – Capital Design Group will meet with you to discuss your goals, budget parameters, and completion timeframe. We will assist you in defining the scope of the project. Initial Budget Draft – Following the initial consultation, Capital Design Group will draft a rough budget for your project and outline specific ideas that may maximize return on your investment. Formal Contract – When the project’s parameters have been formally defined, Capital Design Group will present you with a contract agreement. Product Selections and Drawings – At this stage, a formalized vision for your remodeling project begins to take shape. Capital Design Group will assist you in selecting finishes, accents and hardware, then we will prepare design drawings that incorporate these selections. Final Estimate – Upon your approval of the product selections and design drawings, Capital Design Group will create a formal cost estimate for your project. Clients may choose for us to estimate projects for a fixed, bottom-line cost, or to base the estimate on net materials costs plus a set fee. No physical construction will begin until all parties have agreed upon and signed the estimate. Production Schedule/Timeline – Capital Design Group will provide you with a written production timeline. Proceed with Construction – Upon ratification of the estimate, construction will begin. Quality Control/Project Management – You will be assigned a Project Manager as your dedicated point of contact throughout the construction process. Capital Design Group will also give you a printed Project Specification Book so that you have all specification details in writing. Warranty – Capital Design Group offers a written one-year structural and workmanship warranty on your remodeling project. Capital Design Group has a subsidiary, DBLee Construction, that is prepared to work with your architect if you have elected to engage another design professional. Using the same rigors and standards of our design-build process, DBLee Construction will deliver a high-quality product that we will stand behind. We have a strong track record of working with and building the designs of some of the region’s finest architects, including BBGM, Bonstra/Haresign, and Harpole. Do you have a property that you want to re-develop but you are not sure what direction to go in? DBLee Development would welcome the opportunity to work with you in a joint venture capacity to transform your property into its highest and best use, while maximizing return on investment. Please see www.dbleedevelopment.com for more information on how we work and our accomplishments to date.